Alchemy restored — wonders and miracles in the App Store. These past few days has been an exciting time for many iOS musicians. We’ve had a couple of very special, new apps hit the App Store, and a near miracle occurred with the return of Alchemy Synth. As it was a tragedy, I will mention Alchemy Synth first. Hooray — Alchemy has returned to the App Store. This has been my favorite music creation app, a real go-to app for me over the last three years. Well, the app developers, Camel Audio, shuttered their doors (went under and closed shop a few months back), and the app was pulled from the App Store. Well, however news had surfaced that Apple bought them and that by June or July there would be some answers for the app owners. This is a big deal for many fans of this synth app because without an entry in the App Store, restoring previous in app purchases was very difficult if not impossible for some. And heck just getting the app on say, a new device, was near impossible as well. But today there is an App Store update and the update info states that it is all about restoring the previous IAPs. I am doing exactly that on my iPad-mini retina where just five days ago I had deleted Alchemy to get back badly needed storage space. It was the advent of a new app, or a couple of them actually, that allowed me to feel comfortable with deleting Alchemy from one of my iDevices. Korg made a surprise released of the iM1 synth workstation app just days after KV331 Audio released their highly anticipated Synthmaster app. Synthmaster for iPad is similar to Alchemy in many regards; they both come from existing desktop software synths, both offer a synth player app, not a true synth, for iOS. Both are initially free with available pro upgrades and IAPs for sound packs. I do like Synthmaster quite a bit In the short time I have played with it, even though the app had a bit of trouble at launch and needs some fixes and a new UI. However, the sounds are brill. 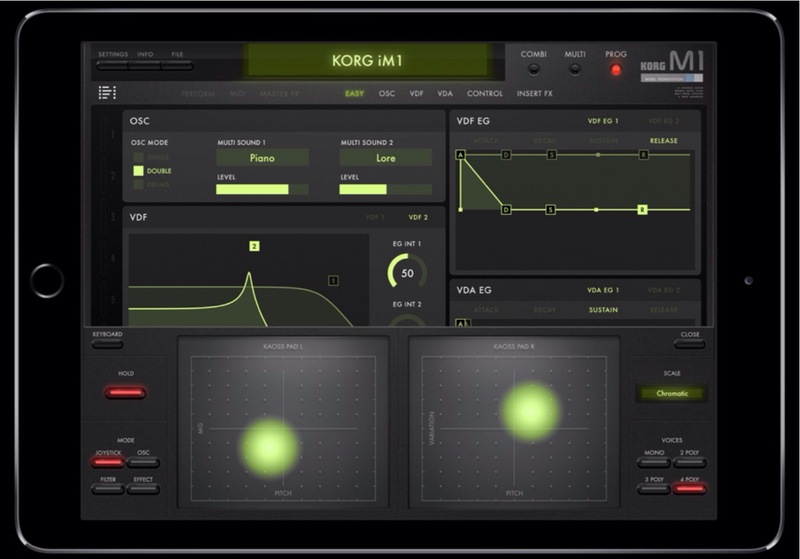 Just as I was getting used to Synthmaster; Korg released the iM1 synth workstation app. Again, an app that comes from the desktop, but even better in that they emulate the real hardware from the widely sold Korg M1 synth workstation. This app offers a couple of inexpensive sound packs (emulating the memory cards that were used in the hardware…back in the day). With the IAPs there are more than 1,800 instrument sounds. Now, many sounds throughout the cards are a bit redundant, but they are very good, high quality sounds. But it gets even better. Korg’s iM1 offer some unique performance options including built in Kaos pads, a chord player, multi-layered sounds, tweakable parameters, and more. But maybe the neatest trick is that iM1 is available as a new instrument from within Korg’s fantastic Gadget app. It is a great, and for me, a needed addition to Gadget. Each of these apps in their unique way, provide for me an inspiring music making environment. Once the inspiration turns to perspiration, with both Gadget and Alchemy, as examples, I can easily take the music, and the MIDI data files out and get those into a DAW (desktop or iPad) for further recording, mixing, and mastering. Arturia-SEM – #21. I have the iOS iSem app and am quite fond of it. Z3TA+ – #14. I do not own the iOS app, but it is a high-rated, and much loved synth. SynthMaster – #2. Synthmaster, the synth is number two for desktop users, that is cool news. For iOS we have the Synthmaster player app, a player of preset sounds…fantastic sounds that someone else designed and tweaked…I love it, since I don’t have much time for that stuff. * I should also mention that #30 on the list is the Fab Filter Twin 2 synth which is coming to iOS as a part of the future Auria Pro upgrade. The thing that really strikes me here is seeing iOS get even more seasoned software developers porting their work over…it is a growing trend. There are rumors in the air of even more coming. Also to mention is how some apps have gone the other way, porting from iOS to the desktop as a plug-in. Again this is nothing new, several iOS music apps also exist in a similar form on the desktop, such as Nano Studio, Sunvox, Crystal Synth; all very good software music tools. But the difference it seems is that larger music software developer shops are coming on board to iOS in larger numbers (admittedly, KV331 Audio is not a big firm, but they are not a 1 or 2 person shop either…or they have a lot of other resources). But these are known entities, and it feels really good to see these quality apps coming and knowing there is a big bright future for iOS music making. There’s been a lot of app news and fun things happening recently, but the most important question is: what does this do for my music? Well, I hope to answer that soon with some groovy new tunes.